Flexible, independent intermediate storage system with a high storage capacity for diverse work pieces. Part feeding on euro pallets (1,200 x 800 mm) with direct connection to automation system. The storage system has several vertical layers that are connected on the front with two lifting units. The upper levels are used to store raw/finished part pallets. The lower level incorporates loading slots into which the pallets containing the raw parts are fed and from which the pallets containing the finished parts are discharged. This process is practically independent of the processing cycle stage. As a result, the storage system can be loaded and unloaded without interrupting production. On the opposite side to the loading mechanism, a robot can work independently with raw parts, placing them back onto the pallets once they are finished. As soon as a pallet has been processed, it is automatically returned to the storage system and the next pallet of raw parts is supplied to the robot. The storage system loading and unloading processes are practically independent of production. Processed pallets can be removed and new pallets can be admitted at any time. The storage system has a space-saving design since the pallet slots can be used for pallets containing either raw parts or finished parts. The robot automatically recognises parts and transfers them to the processing machines The entire plant can be operated without personnel for a period of several days (unmanned shifts). 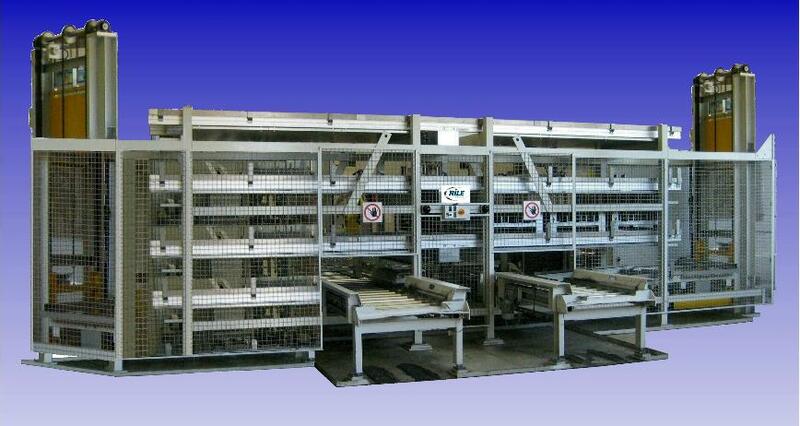 Production of work piece families The storage capacity for pallets can be increased at any time by adding modules. Modules can be added to the breadth or height of the storage system. Multiple robots can be fed with raw parts by one storage system. The work pieces are supplied to the storage system on standard euro pallets (1,200 x 800 mm). Robot and plant automation in part processing and machining For series manufacturing of different, related, or identical work pieces.